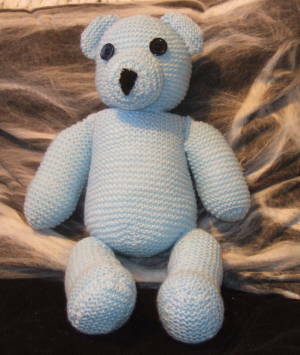 My first knitted bear from a free pattern by Debbie Bliss found through Ravelry. Finally I have managed to get through all of this mystery blue yarn with this little ‘cuddly’ bear. The pattern was relatively clear to follow, I could have done with more instruction on how to attach the limbs and the size to cut the features. The pattern recommends cutting out some black felt and stitching onto the bear but without a template I didn’t trust myself so I embroidered the nose and attached buttons for eyes, so I have ended up with a Coraline-esque ‘other bear’. I may redo the features at some point as I think the bear is looking kind of evil at the moment. What do you think? 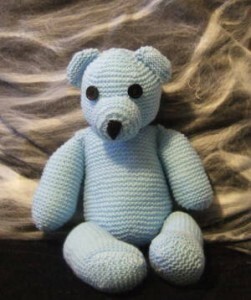 Hi, do you still have this pattern, the link on ravelry will no longer download it?! Thanks for any help! I saw your bear on Ravelry and thought it was gorgeous. I went searching everywhere for the pattern but found that it had been removed from the site as well. I’ve even put the book on hold at my library but its not available for at least another month, so thank you so much for linking back to the original pattern. I’ve bookmarked, saved and printed it just to be sure I can’t loose it!